Seriously, I feel the tears forming. The sun came out just as I was taking this! I love it! And really, I could weep. These pieces sat in a drawer for more than 16 years. (Original post is HERE.) I packed them and moved them to a new house. I considered finishing the quilt several times. I lost some of the fabric. The instructions became outdated and incomprehensible. I finally pulled the pieces out a couple of months ago, during the red month of the Rainbow Scrap Challenge. I found one of Bonnie Hunter's free patterns and finally went for it. And now it's done! The finished size of this baby is about 58 by 68. I have only a small handful of random pieces left. (Happy dance!) I like the way the checkerboard border turned out, but I'm not eager to do another one any time soon. So many seams! Stretchy! And I wasn't sure about the green, but now I like it a lot. Gives it just a little zing. I might even use it for the binding. I learned a couple of things while making this. First, I am MUCH better at sewing now than I was 16 years ago. I guess I learned a few things in between. Some of those 9-patches are a little off, but I left them anyway. Would you have ripped every one of them apart to fix them? Yeah, me neither. Another thing I learned is that the fabric has definitely gotten better too. The red fabric in this quilt was first quality fabric, purchased at the shop where I took the class, and it is quite thin and very ravelly (if that's a word). Ripping some of those smaller pieces to make the checkerboard pieces was difficult because the fabric would actually tear. Today I would reject it as poor quality. So I guess we're getting some good value for our $12 a yard. And look what I got out of the leftover green border-- a bright green Odd Fellow! He looks happy. (Oops. I see a star point cut off. I'll fix that right away.) And here's the second red Odd Fellow's, which I also finally finished this week. Do you know what this means? For the next 48 hours, I am completely caught up with RSC14! I plan to enjoy it while it lasts. It's Labor Day weekend, so everyone enjoy the last weekend of summer. Hope you're inspired to pull something old out of the closet or the drawer and give it a new life! 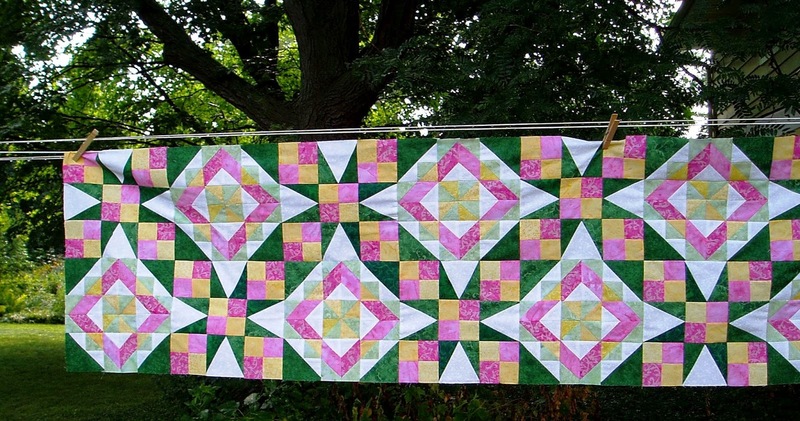 Linking to Confessions of a Fabric Addict, crazy mom quilts, and the awesome Angela! Visit sometime this weekend for some more fun projects. A very short post today. I'm still not into the "new" routine, and I have at least 4 hours of paperwork/ other desk work to finish today. We were supposed to become a paperless society by now, but all that means really is that the "paper" has moved to the computer. And here I thought we were actually being promised less work. Silly me. Yes! All those 9-patches are sewn up! The top is thrown over the fence, so it's actually a little bigger. And they do look like they're dancing! Anyway, hope everyone is having a really productive week. Here's wishing for less paperwork for everyone! Linking to WIP Wednesday and Let's Bee Social. Stop on over if you have a minute! 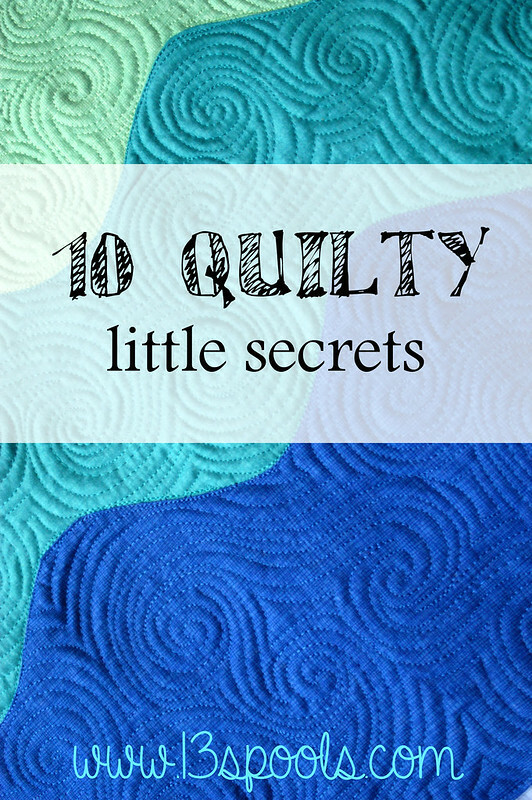 Everybody has a secret, and Amy over at 13 Spools started a little thing that is making it's way around the interwebs--10 quilty little secrets! So here's my confession. Tell me yours in the comments, or link up with Amy and let the world know! But definitely go check out some others in her linkup, because it will make you feel better about your own secrets. 2.The best thing my grandmother ever taught me? "Don't worry--it will quilt out." 3.I really, really dislike pieced backings. 4.Sometimes I plan or doodle quilts or designs during meetings. It's possible that I have lost track of the meeting topic once or twice while doing this. 5. I feel guilty about how much fabric I own. 6. I often love the process much more than the finished product. 7. 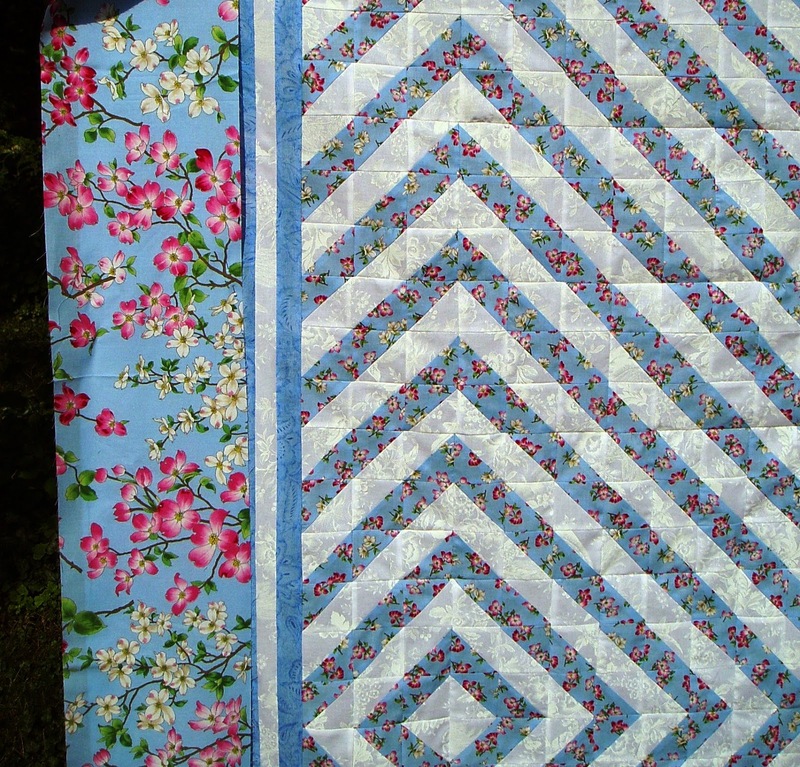 I love my longarm quilter but secretly think that edge to edge designs make my quilts look like they came from a store. 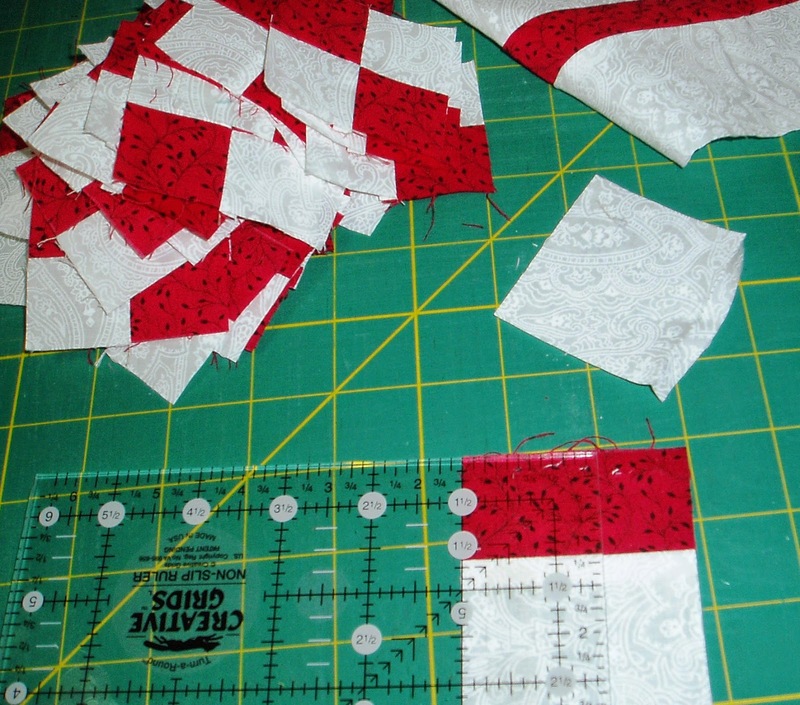 I can't afford custom quilting or my own longarm, so the alternative is unfinished quilts because the big quilts I make are too much for me to quilt on my own. Yes, shame on me. 8. 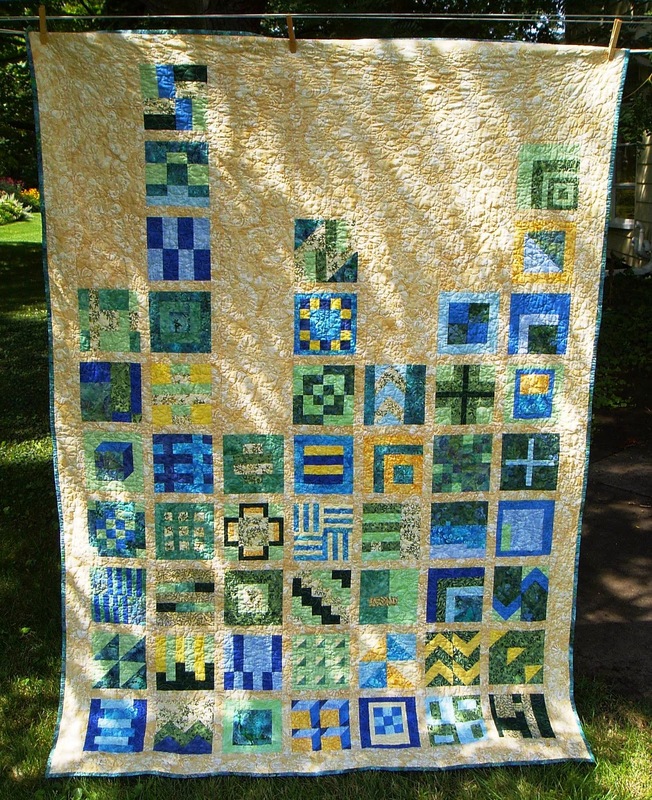 I like quilt shows but the idea of competition between quilters turns my stomach. 9. Paper piecing? Yes! Applique? Sure! 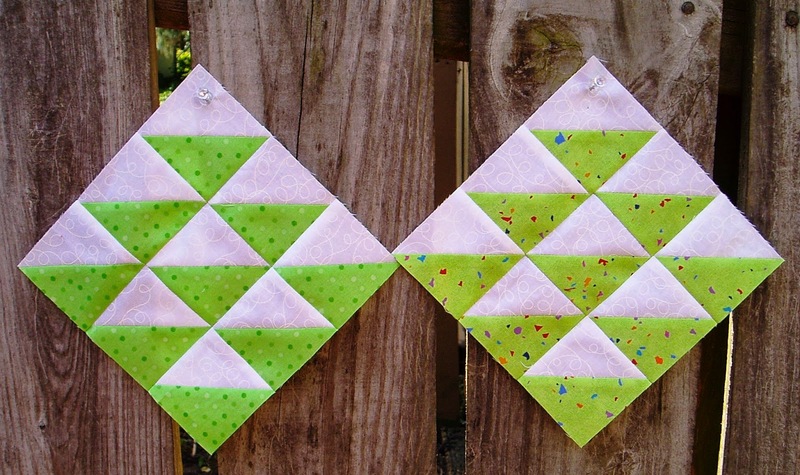 Hexies and EPP? Why not! Traditional? Absolutely. Modern? Maybe, if you get rid of all the gray and fill up those empty spaces. Civil war? No. Wonky? Please get out of my sewing room. 10. I break every quilting "rule." I use lots of steam, sew over pins, iron with abandon, use cheap needles and thread, never prewash, cut the 'wrong' way, and use rotary blades until I can run them across my hand without getting cut. I also buy some of my fabric at rummage sales. Pretty sure that's a no-no. 11. Even though I've been doing this for a long time, I secretly worry that I'm not very good at it. That's it for today! Share your secrets in the comments! Well, this has been a crazy week. Just insane. Looking around, though, it seems like a lot of people had the same experience this week, so I don't feel so bad. Are you like me, and the most annoying part of weeks like this are the parking issues? EVERY day. Let's get it together, people! I swear this is square! Well, he's a cheerful fellow, even if he is odd! This one is made from scraps of one of my favorite greens of all time. It's a few years old and was a part of the Sunshine line by April Cornell. I've hoarded the scraps and finally used a bunch here. I think it's very festive. 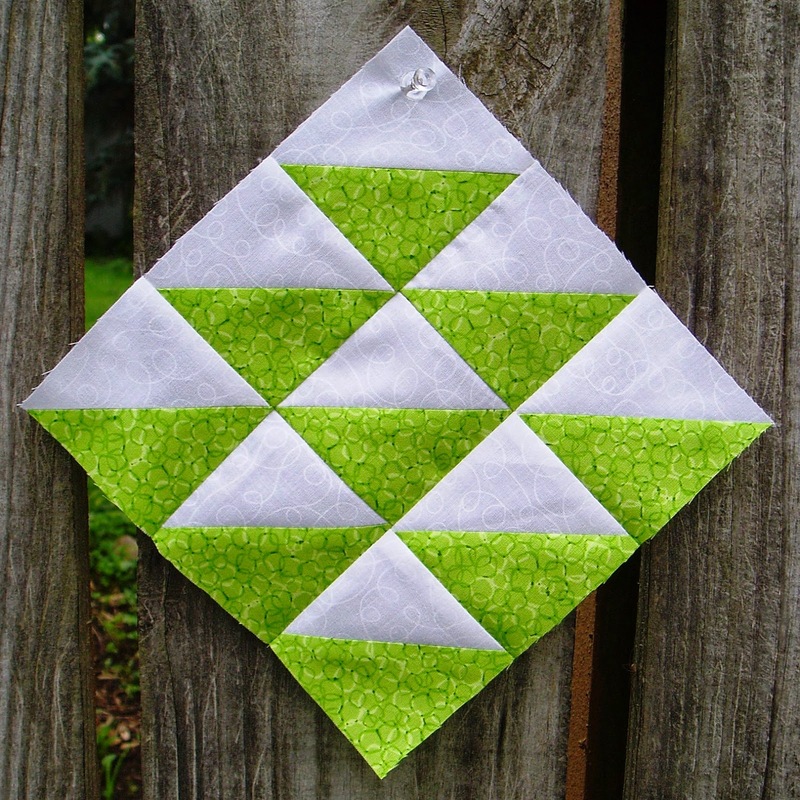 I was thinking that I never would have set out to make an Odd Fellow's quilt without the scrap challenge, but making two a month is really manageable. Not that I'm fully caught up or anything. 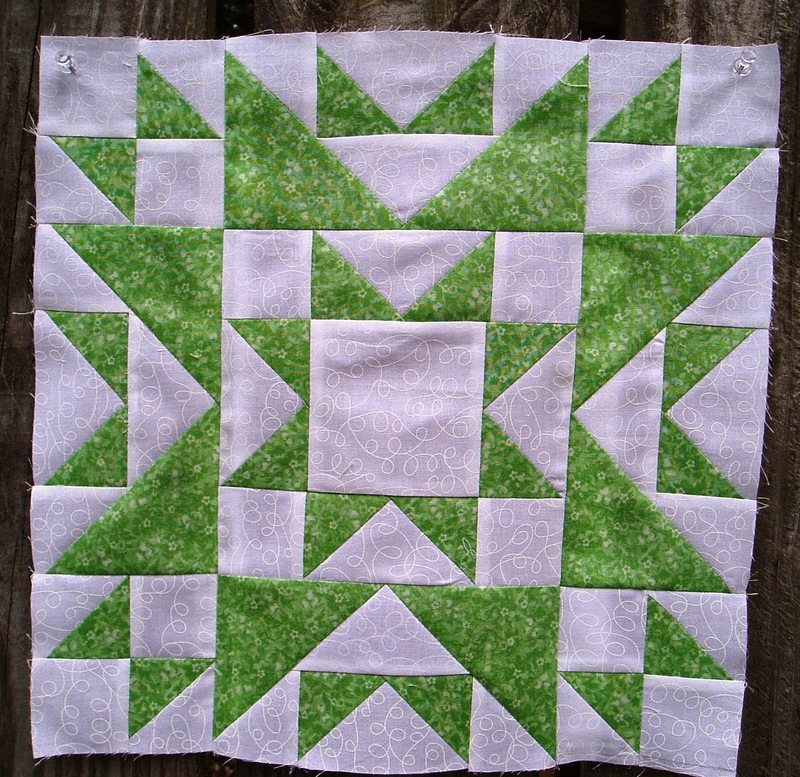 There is also this final bright green 9-patch for the other rainbow quilt. Also quite cheerful! And finished! That was my crazy week, friends. Hope yours was more productive! Linking with Sarah and Amanda Jean and also Angela. Stop by and say hi! And everybody have a very relaxing weekend--we all deserve it! Ever have a time when you just have to slow down a little with your sewing because it's starting to feel like work? That's how I'm feeling right now. Still recovering from Celtic Solstice, I guess. It was completely mentally exhausting. I've learned the hard way not to sew anything important in that state. I really want to finish the Dancing Nines quilt, but I just had to take a small break from the "have to" sewing for a little bit. Plus, have you checked the calendar? Aaahh! Not that I'm panicking or anything. Artsy pictures! I also made another one that I gave to my brother in law, but I never got a picture of it. 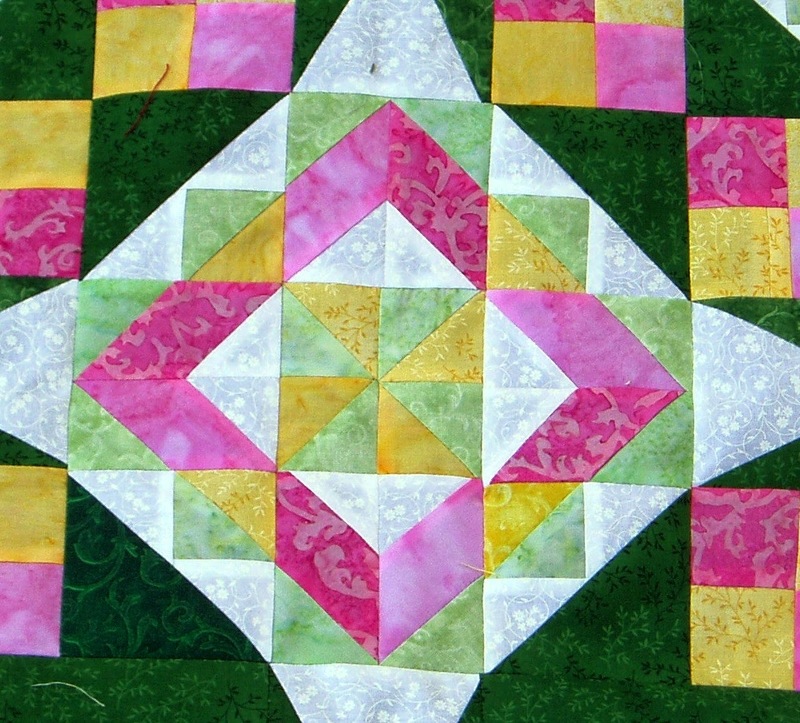 The black and white block above is made from Tula Pink's block #49. 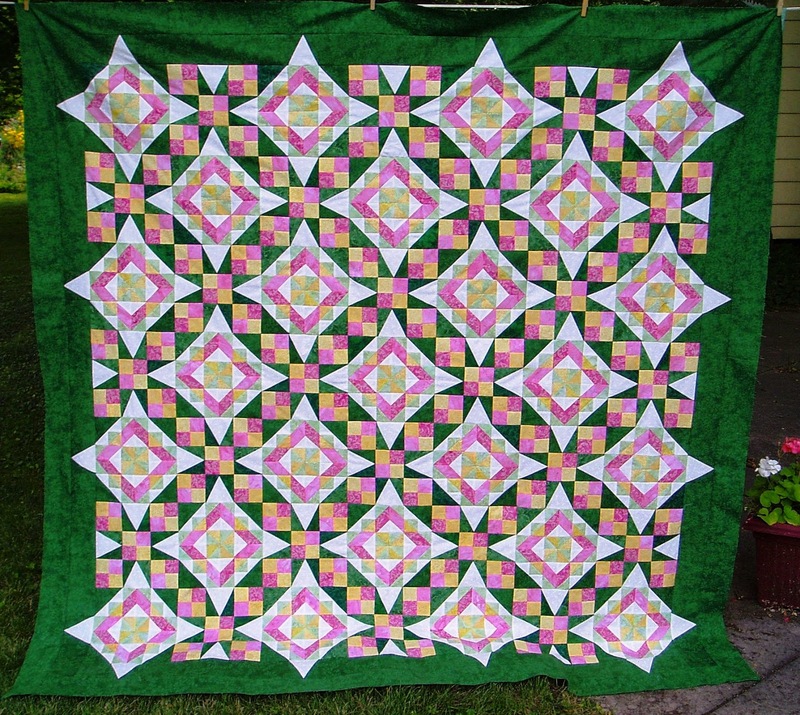 It's in pink and green in the baby quilt above. I think a different (more open) black and white would be better and make a nice quilt. This black and white is lovely on the bolt, but it comes out looking too gray and striped. It would be better in a different project. 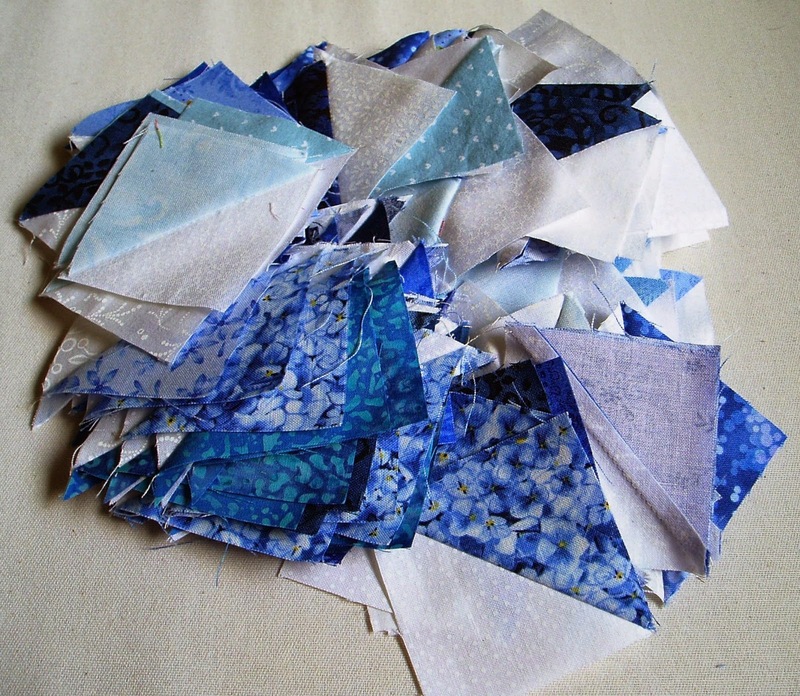 These are some of the more than 300 blue and white HSTs that I've been making as a leader/ender project for a while now, all trimmed and ready to use. I guess it's time to put that quilt together! 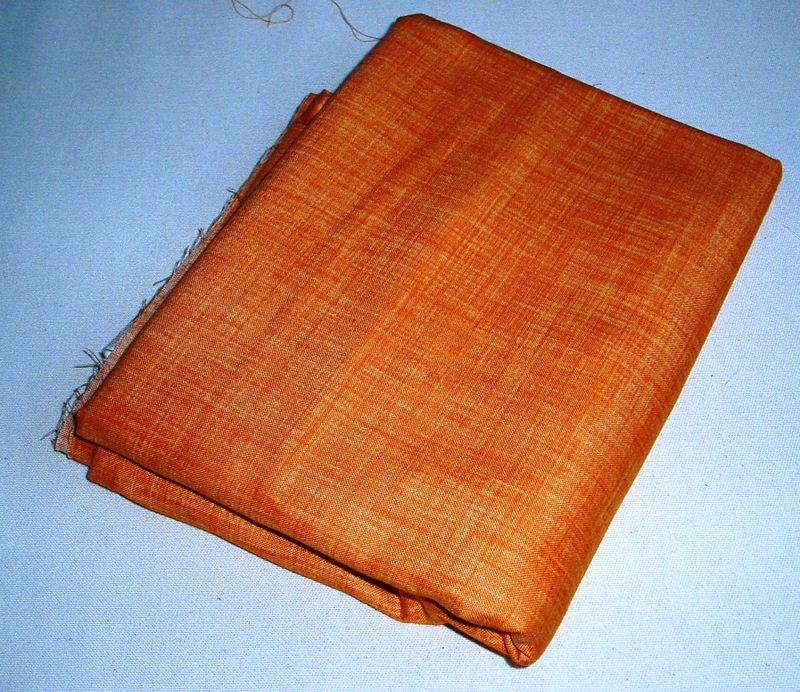 Stunning photo, I know, but this is the new orange that I picked out to use with the aqua triangle quilt. I think I also finally have a plan for it too, so that will come soon. So, I'm doing some relaxed sewing for right now, but the Dancing Nines is still calling my name. I'll probably get to it as soon as I clean out the danged sewing room. Again. There are pink and green bits everywhere! Have a relaxing week friends! Linking to Connie, Lee, and Lorna, as always! Too big for the clothesline! As you may remember, this quilt has been a struggle. HERE's a whole post about it. And you should know that I struggled right up to the end. Putting the blocks into rows and then stitching the rows together was a nightmare. So much matching! I couldn't just match the block seams, but also had to match every seam within the blocks. Slow and frustrating. The border also gave me fits. First I couldn't decide what to do with it, then I had trouble lining everything up. In the end, I am much happier with it than I would have been with the original pattern. I think it came out okay. The final quilt measures about 78 by 78. 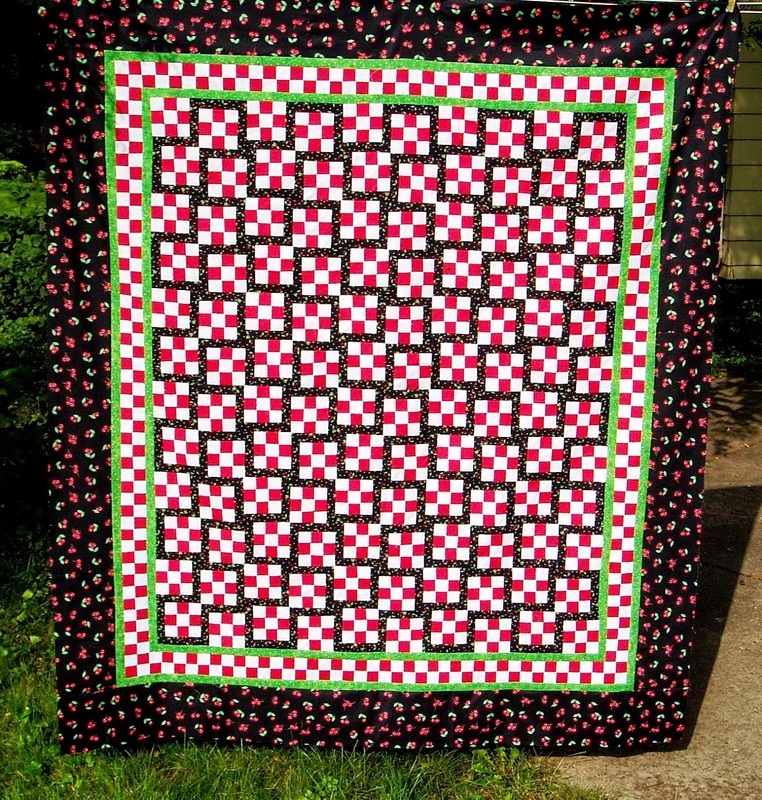 Truthfully, there is nothing about this quilt that was really difficult. All of the units were pretty basic and easy to make. There were just soooo many! Even the chevron sections didn't give me much problem. 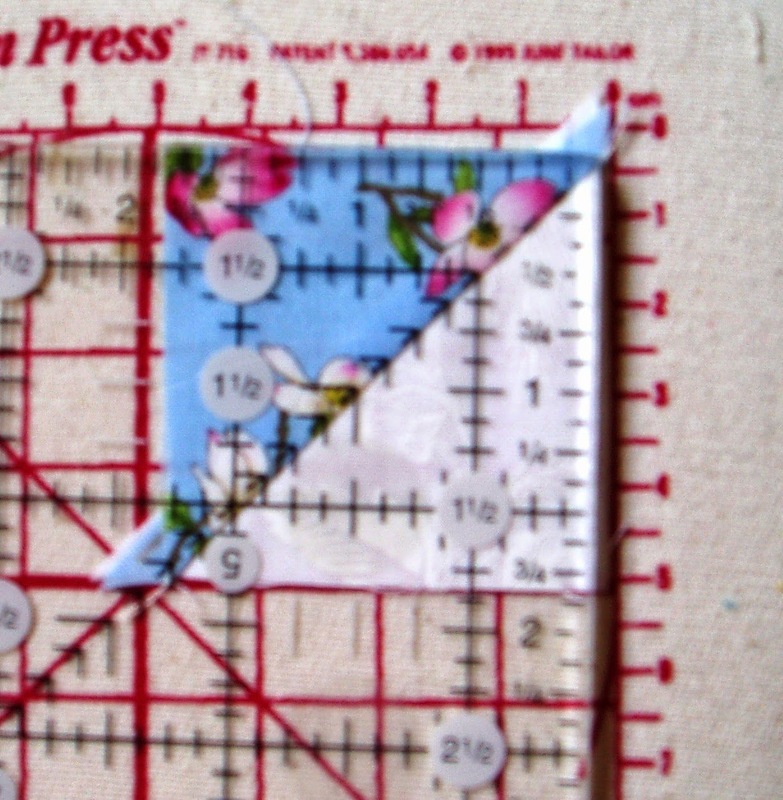 I strip pieced them using this tutorial. Even though they were easy enough, there are some things I would have changed had I known in advance what the finished quilt would look like. 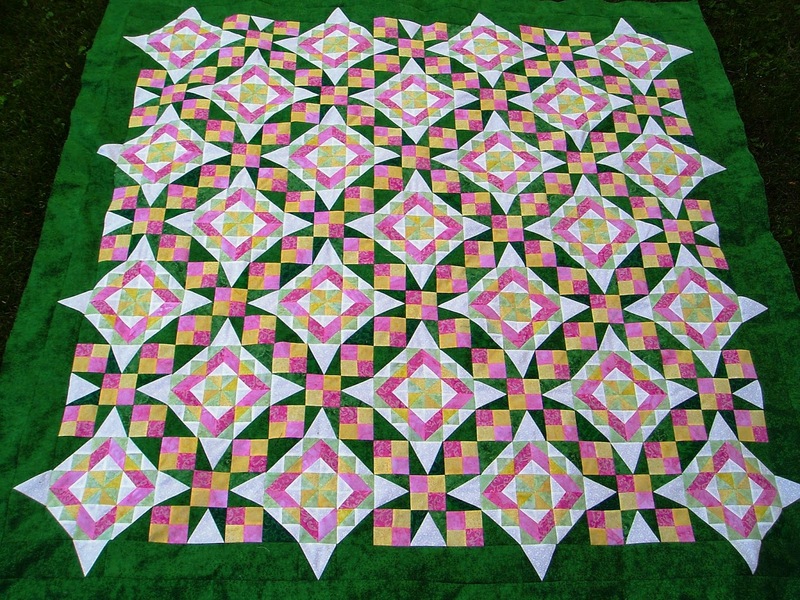 For example, I would never have made pinwheels for the center of the "birthday girl" blocks. I think they'd be much more attractive as a solid square. But I had already made the pinwheels so I used them. I would probably have chosen different colors as well, but I'm okay with how these turned out. I'm a little disappointed with how the dark green looks with everything else, and I probably would have chosen to switch the green and the pink. But it's done! 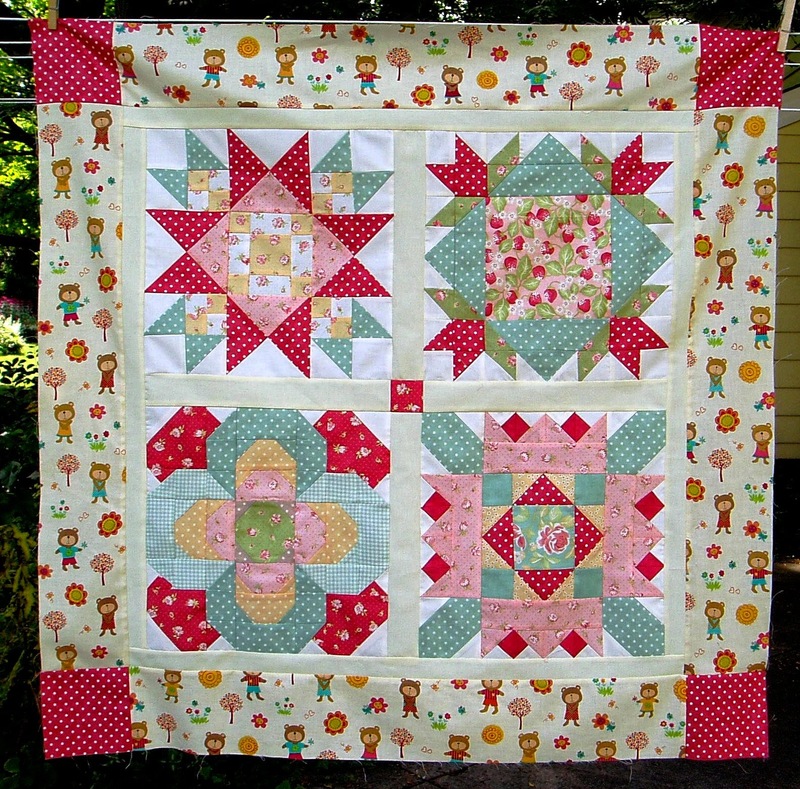 Even though I struggled mightily with this quilt, I still love Bonnie Hunter quilts and patterns, and I love how generous she is with her work. 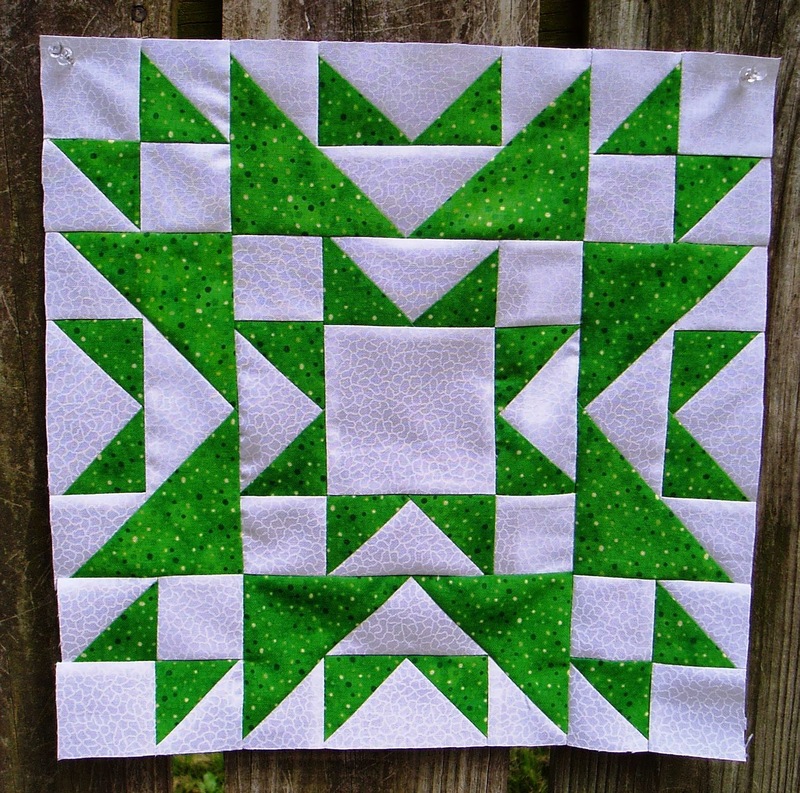 She has a TON of free patterns and offers a mystery quilt for a limited time every year. So will I make another one of her mystery quilts? Right now, I wouldn't make one as a mystery. I'll wait for the reveal and see, but I'll still follow along and maybe make a few units. But I'm off mysteries for a while. Besides, we all know that I have a bajillion projects waiting in the wings already, so I'm guessing it will be okay. Hope all of you have a great and relaxing weekend as summer winds down. Want to know the best thing about my upcoming weekend? I won't have to think about finishing this quilt anymore! 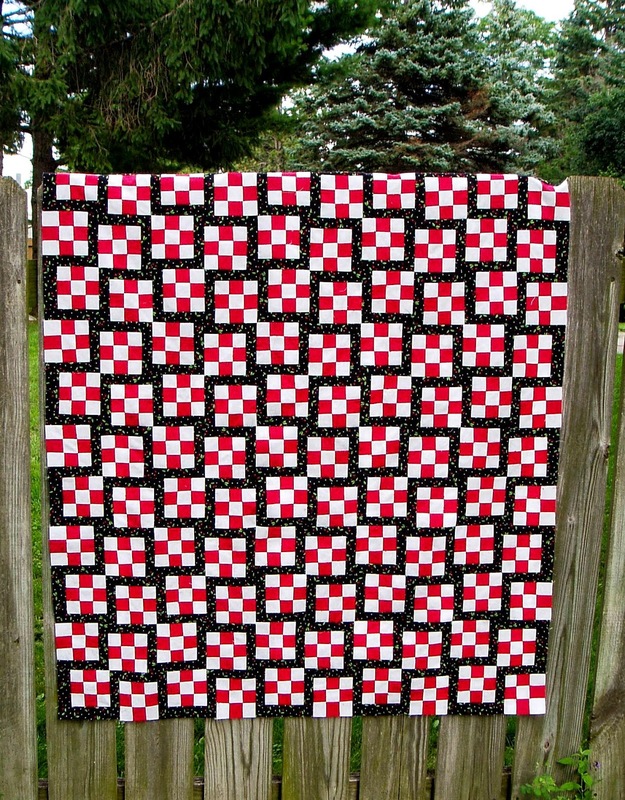 Linking to Confessions of a Fabric Addict, crazy mom quilts, TGIFF, and Richard and Tanya Quilts! Come on over and check out some great projects! A LOT has been happening in my sewing room so far this week. There are three projects that are racing toward the finish line very fast. Wonder which one will get there first? 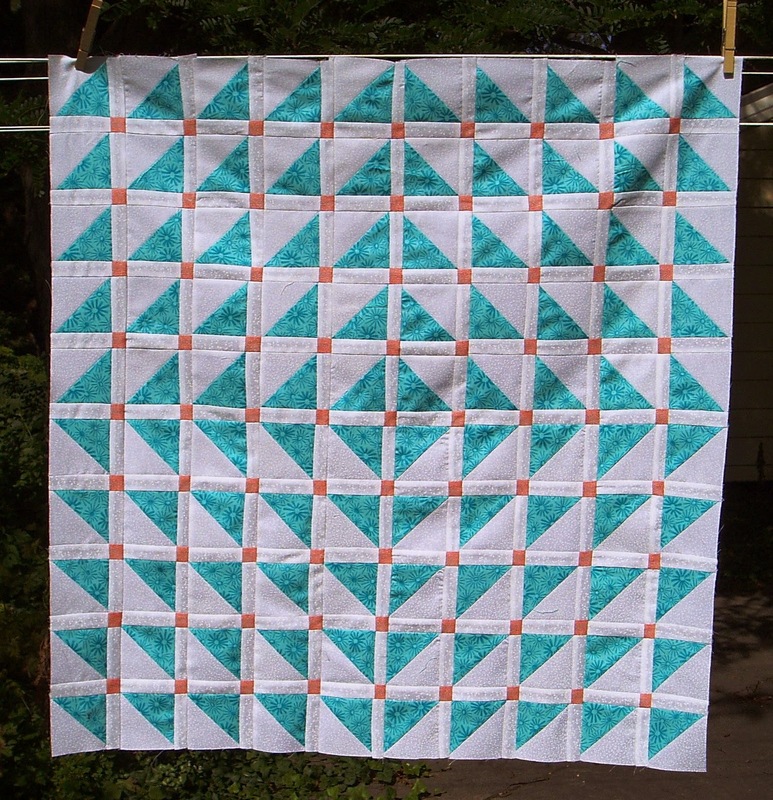 First up is the aqua and orange quilt. 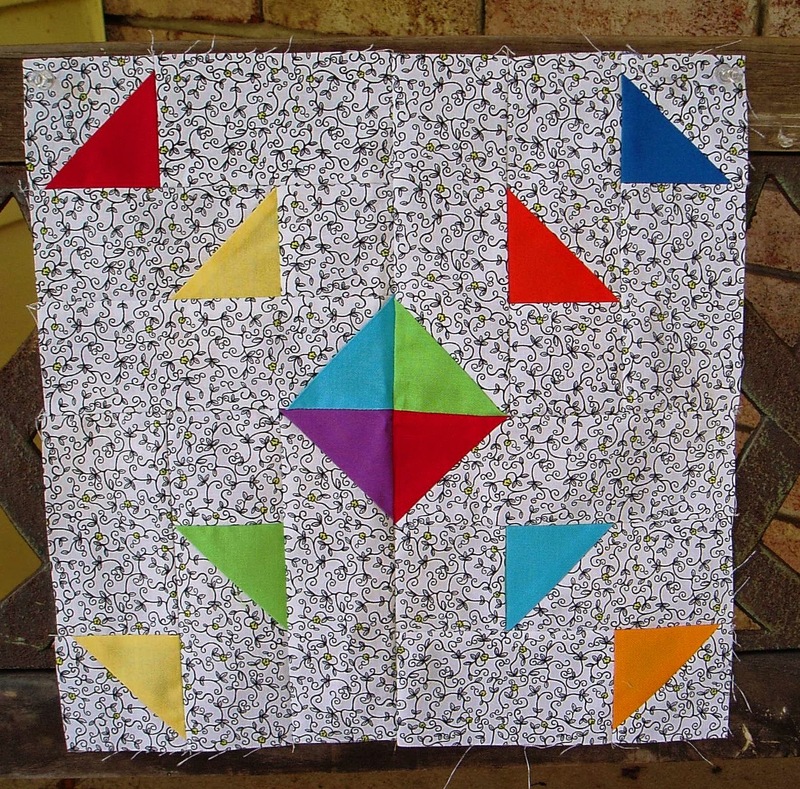 I finished the center and then decided to put some orange flying geese as a border. Wow, is that ever bad. I really, really don't like it. The scale is all wrong, and the seams hit funny. As soon as I realized from the picture how very bad it looked, I took it off. Time to try something else. 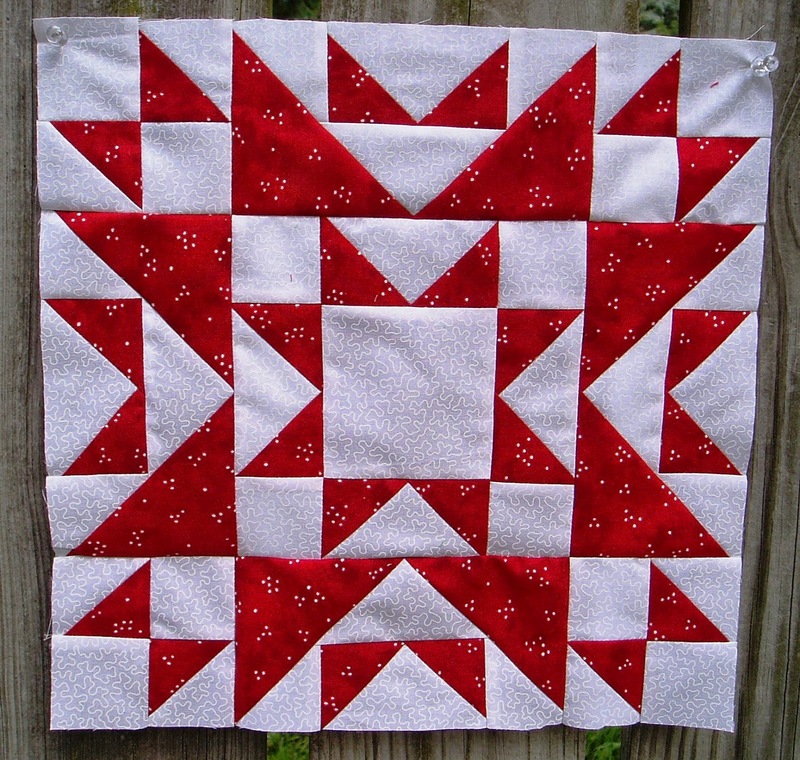 I think a thin border and then some smaller flying geese that won't have to match up to the existing seams. And a different orange. Definitely a different orange. 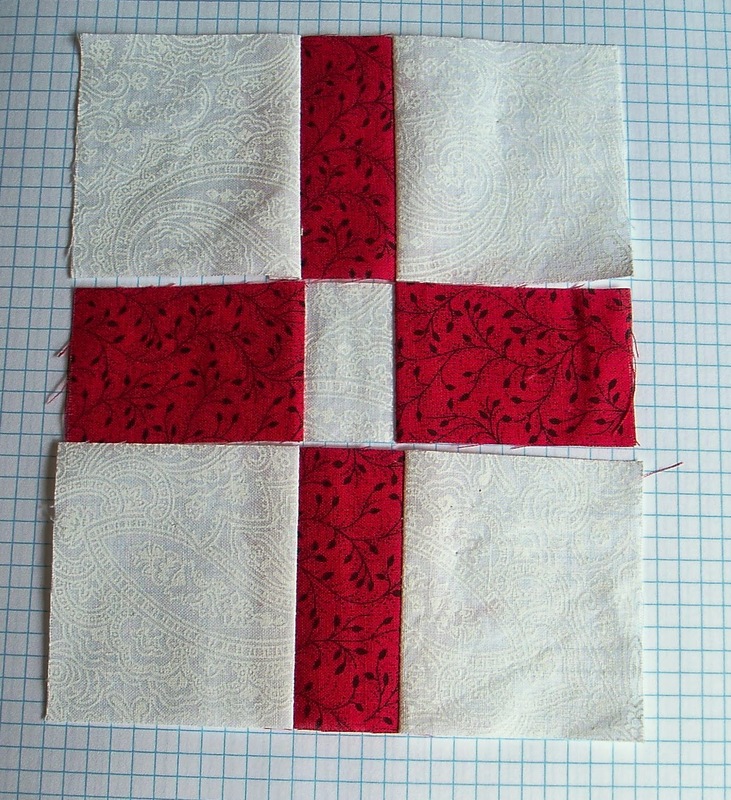 Then I have the red and white Dancing Nines quilt, which is coming along nicely. Look, I'm making 4 patches from the leftover pieces! It may not make an exciting picture, but I am seriously excited about this. I started with 68 and need a bunch more. The extra pieces have to be taken apart to make them the right size, so there are threads everywhere. And I may need to buy a new seam ripper, one that will actually cut thread. How much ripping do you have to do to dull a seam ripper? Okay, weird size picture, but this is two rows of the much-postponed Celtic Solstice project. I am FINALLY putting it together. I don't know if it feels good yet or not; mostly I just feel relieved. I have had to bargain with myself to work on it, as in "you can't sew on the Dancing Nines until you sew two CS blocks together." Hey, whatever works, right? The next hurdle is figuring out a border, but I can see the end of the tunnel. And I'm pretty sure that it's not an oncoming train. 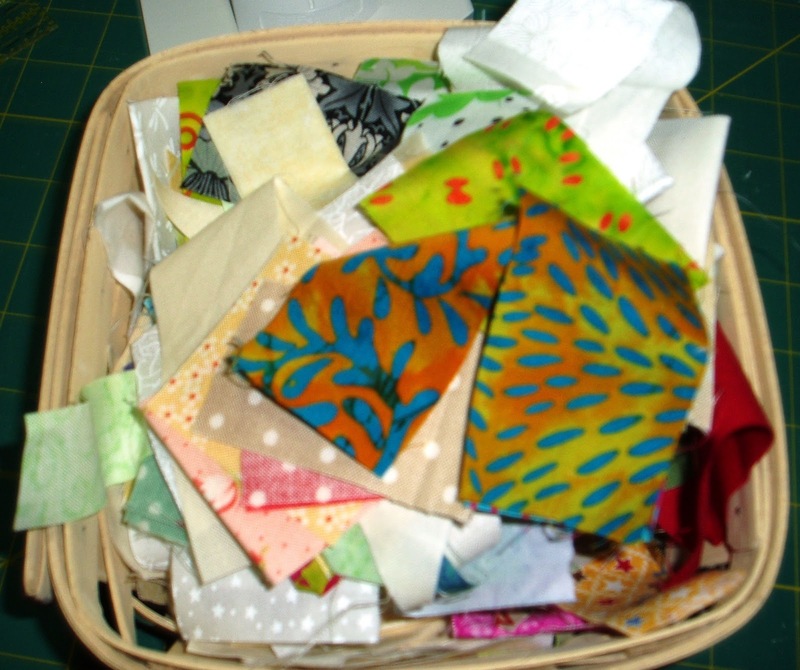 That's a basket of small scraps to be cut into 1 1/2 and 2 inch squares. It'll be relaxing, right? Hope your sewing is also going well! Linking to Linky Tuesday, WIP Wednesday, and Let's Bee Social. Come on over and join us! Hello all, and welcome to another summer weekend! I am trying to treasure every remaining one, because they are just flying by. Soon enough we'll be talking about the dreaded winter weather, so best to enjoy it while we can! 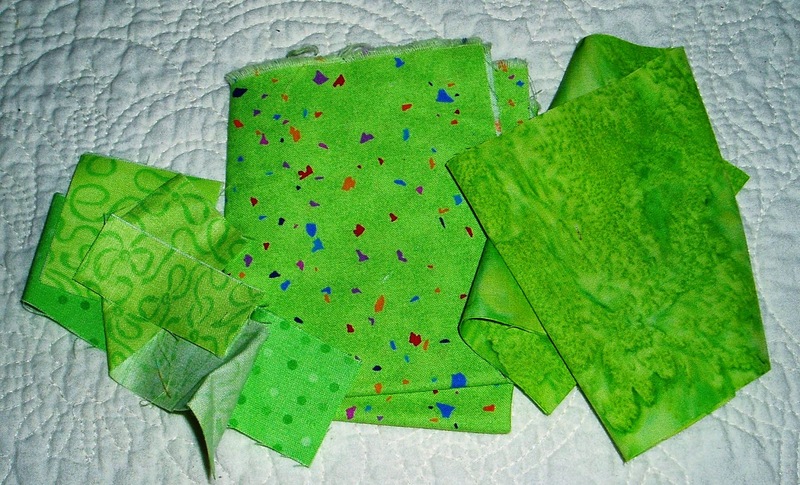 And that's the end of my bright green scraps! Sad, I know. But I'm going to trade with a friend to get some more, so I'll have some soon. She wants some beiges and tans, which I have plenty of, so we both win. And August has 5 Saturdays, so I have some time, too. I like it, but here's my problem: I don't know where to go next with it. It's not that often I get stuck, but here I guess I was so pleased with the quilt center layout that I didn't think about the rest of the quilt. I thought of a couple options, and so far the best idea I have is a narrow orange border with another border of triangles. 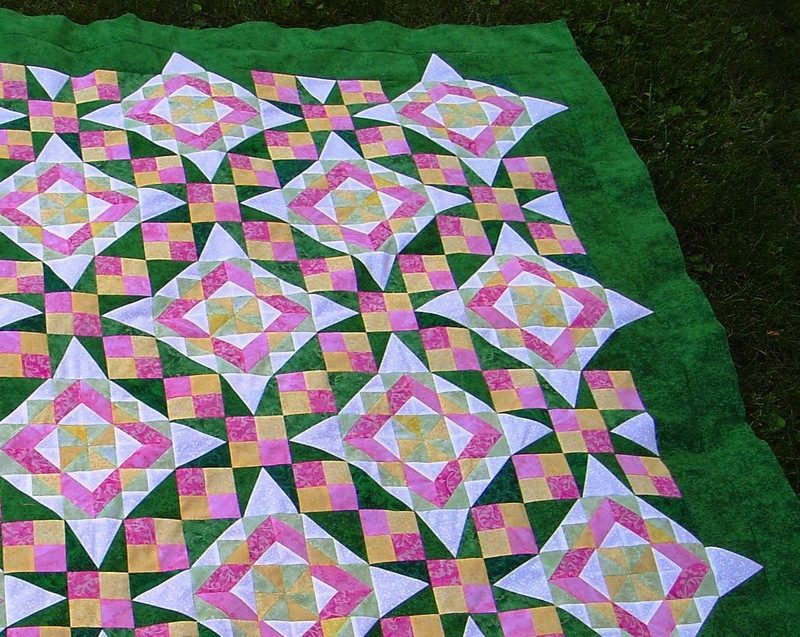 This would use up all of the triangles but one and make the quilt a little bigger. After this, I'm stumped. I know I need borders, but don't know what those would look like. Plain straight borders just don't seem right to me. Maybe some small pinwheels in other colors? I don't know. If you have an idea, let me know! Can you tell that these were made from extra parts? I like how this quilt is progressing. I decided to make 35 more 9 patches so that I can have it set 5 blocks by 6 before borders are added. I have enough other pieces to make these and have some left over to make more of the 4 patches for one of the borders. I could almost cry when I think about using it all up and having a quilt top done from this fabric after 16 years. That's it for me this week! Hope you all got some sewing done too. Our son and daughter-in-law are moving to a new house this weekend, so you can guess what we'll be doing. Linking to Sarah, Amanda Jean, and the awesome Angela. 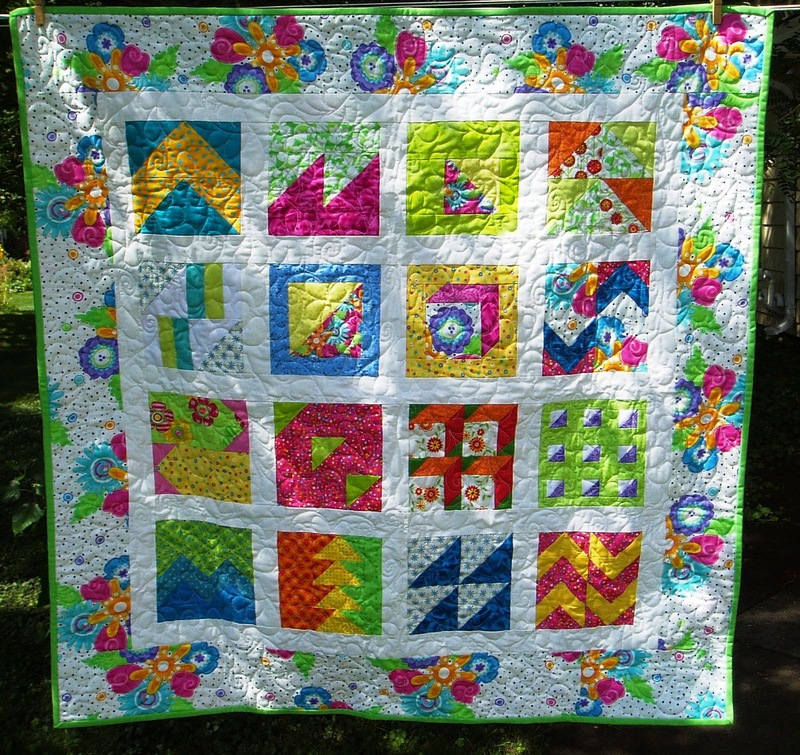 Pop on over for more quilty inspiration! Also, if you followed the story of Pelly the pelican over at Connie's blog (Freemotion by the River), you want to read her post with the latest chapter. If you haven't read the saga, go back and do so. It will warm your heart! Hello all! How is your week going? I really meant it last week when I said it was crunch time. Seems like I have more to do than I have had all summer! Somehow it always gets done, but I have no idea how that happens. Must be magic. Last week I offered the leftover triangles from the fields and furrows finish to a reader who would use them. Several people were interested, and I pulled Joanne's name out of the box. Thanks for taking those off my hands! They are on their way to you. 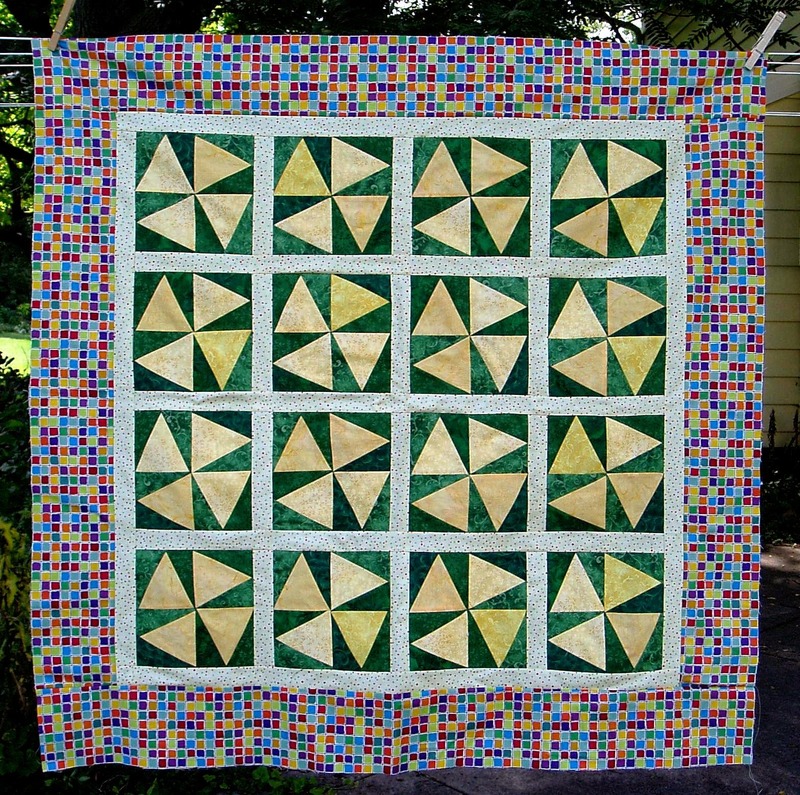 Now that the fields and furrows quilt is done and all those HSTs are out of here, I am left with finishing the aqua triangles and Dancing Nines quilts. (And Celtic Solstice--I know, I know. . . that's another post.) 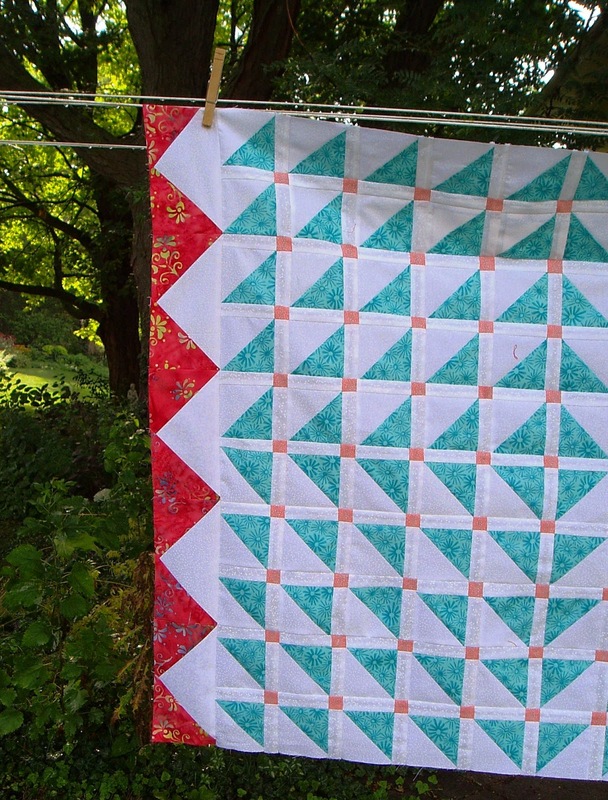 I am still putting the sashing on the aqua triangles. It is tedious, but I like how it's turning out. Forgot pictures, but I promise some when it's together. 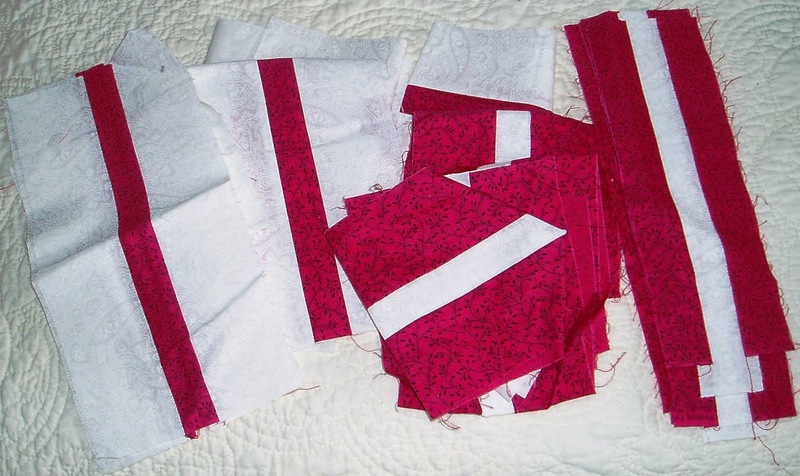 These are leftover strips that the 9 patches were originally made from. 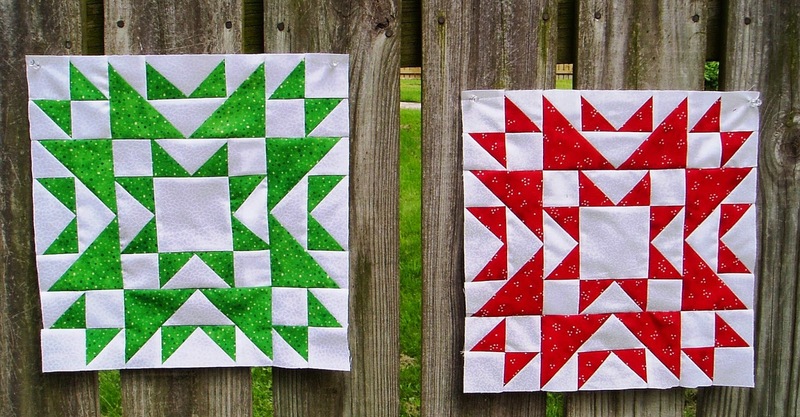 They're already stitched together, so why not make a few more blocks? They certainly aren't going to do anyone any good if they're left over again! So we'll see how many more I can get out of them and how I can configure the quilt center. I am exciting about this quilt, so I'm happy to be working on it. I made the blocks a few years ago as part of a block of the month. As usual, I didn't like the final layout, so I used the other 8 blocks in a different layout and had these left over. They've been in the orphanage for a while, but we pulled them out this weekend and they look great! I didn't have any of the original fabric left, but I was able to find a couple scraps for the corners and the center block, and I think the teddy bear border works well. The colors aren't exactly the same, but they are close--and very cheerful! So, I need to quilt up those two and get them ready for baby showers in September. They're not my grandchildren, but I'm very excited about their arrival! So, that's my agenda for this week. 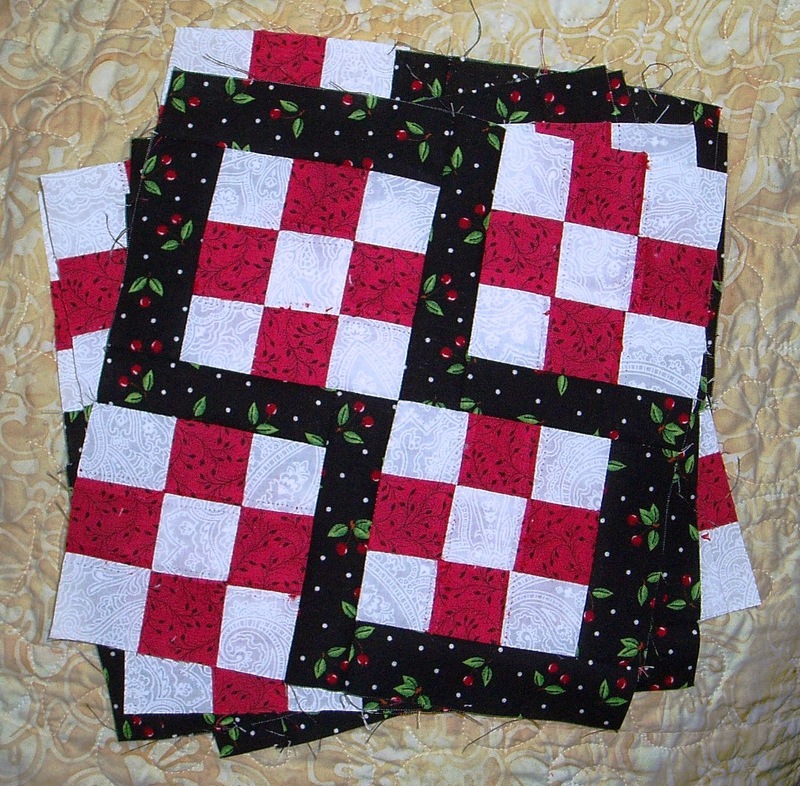 I want to get those quilt centers done really soon so I can finish both of those quilts in the next couple of weeks. Time is of the essence here. Someone also asked me whether the Fiesta Pinwheels top was quilted yet. In case you're also wondering, it's not done yet. My quilter's mother passed away, so there has been a very understandable delay that I am absolutely okay with. Never fear, though, the quilt is in the queue and will be done soon enough. We are having another great summer day today. Hope you are too! Linking to Linky Tuesday, WIP Wednesday, and Let's Bee Social. Buzz on over and check them out! Surprise--it's August! How did THAT happen? A clothesline--my grandmother would be so proud! Aaack! Where did those giant hot pink flowers come from? Yikes. 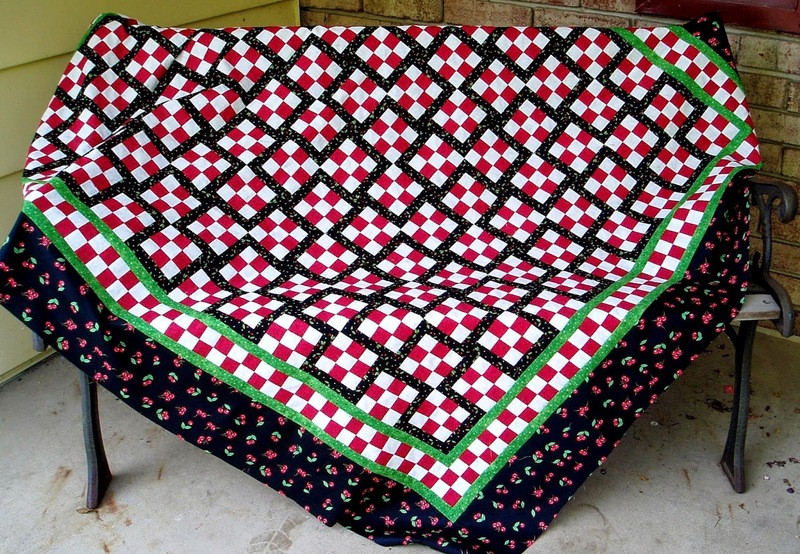 Ok, it's not so bad, but it completely clashes with the relaxed vibe of this quilt. There was no way I could use that fabric on this quilt. Time for Plan C (actually we may be at Plan E or F by now, but. . .) My only real option was the wide white border. I have more of the solid-looking blue for the binding, so that will make a nice frame. I'm disappointed about the border, but I do like the fields and furrows center. I think this is one that I'll like a lot more after it's finished. All in all, I'm fairly happy with how this turned out, especially considering its origins. (For that story, see HERE.) 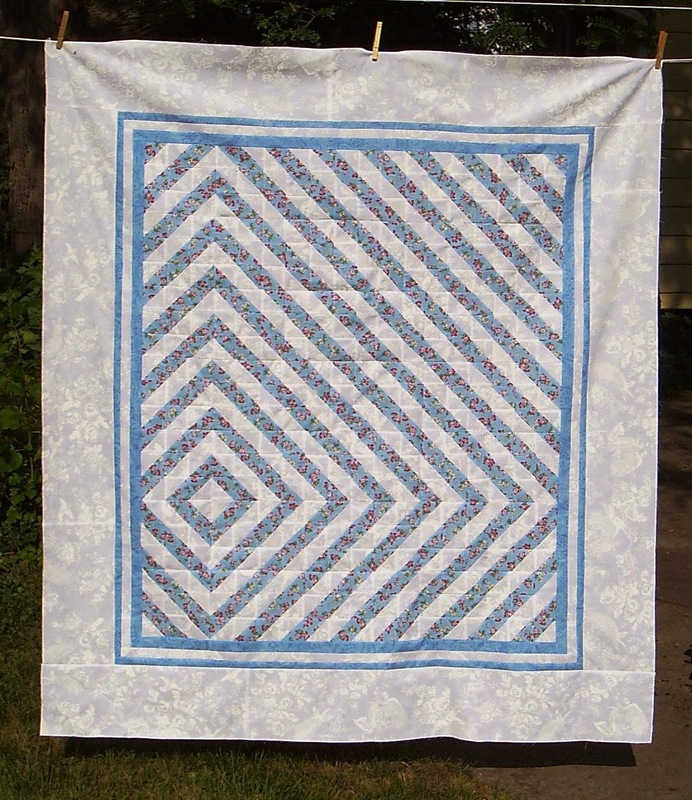 I didn't set out to make a two fabric quilt, but I like how it used up all of those HSTs--and then some, because you may have noticed that what was a 5 by 6 quilt is now a 6 by 7 quilt. 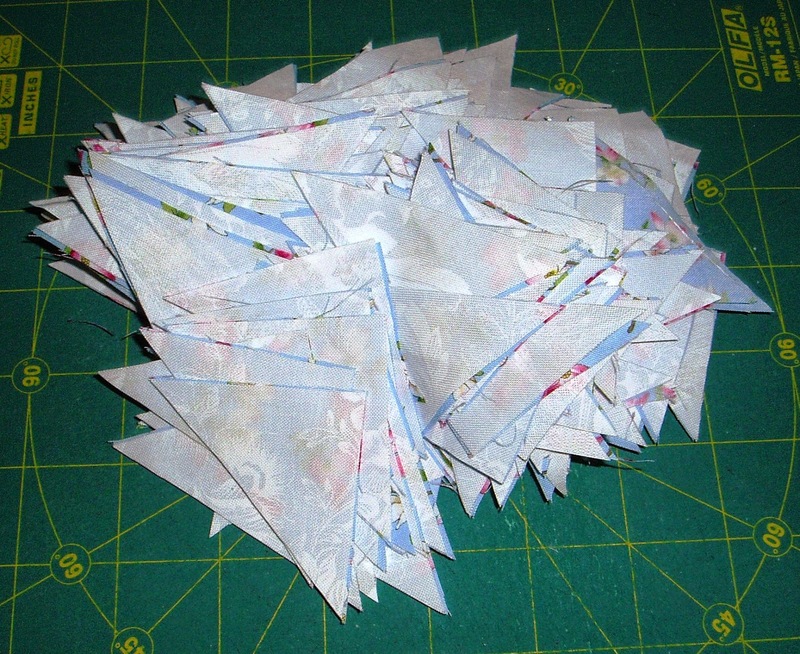 (With 378 HSTs!) I just couldn't leave a triangle behind, so I made a few more so that they all got used up. I'm counting this as a major scrap finish. I'm just sick about that border fabric, though. I can't stand to waste any fabric!I would just give it away, but I feel like at some point I can strip it together with another color to make a backing or something. At least that's what I'm telling myself. Speaking of using every inch of fabric. . .does anyone want these? I can't guarantee that they're all the same size, but probably they could reliably be expected to be 1 1/2 inches, to finish at one inch. They are from first-quality Moda fabric, which means I can't bring myself to throw them out. I could probably come up with something to do with them, but I have plenty of projects. Maybe someone makes miniatures? Any way, if you would like them, I would be happy to mail them to you. Leave me a comment and let me know what you'll do with them. If more than one person wants them, I'll pick a random number. Let's say Monday at noon central time? That sounds good to me. Well, that's my surprise finish! Everyone have a great weekend. I can't believe it's August! Here's to sipping a cool drink during the dog days. I may have to go shopping, and isn't that a tragedy?